Fashion do's or don'ts... sometimes you have to take the Challenge! I offered a Fashion Inspired Challenge recently and I love this answer to it! Orfa has a love of our Melon Mambo - so she took and added this to the card. I love that the same inspiration can create such a large variety of how others see it. 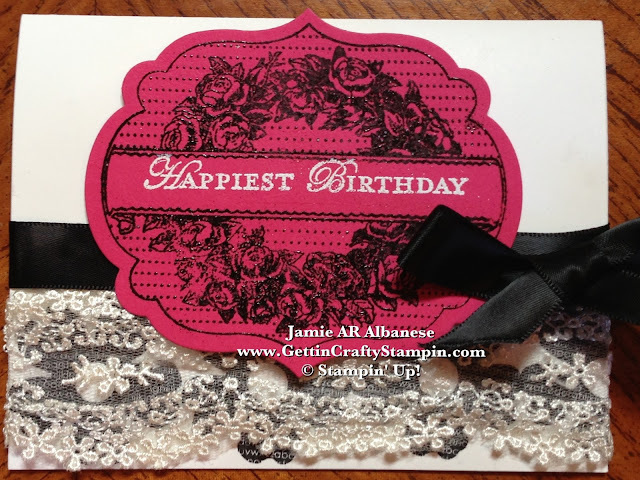 you can create this lovely dress inspired card! YOU, too, can play along! Click HERE to see the Black and White Fashion Challenge. What fashion inspires you?? Leave me a comment and let me know! Pin, Facebook, Tweet... Share and Join me on those avenues with a Follow! Love the BIG SHOT?? Meeee Too!! CLICK HERE to see a cool new Big Shot Club that starts soon! In Person or Virtual entry will make you a Big Shot PRO!! Mixing Black and White with a Bold Color (like Melon Mambo) for a Classic look that is sure to wow! Fashion, like paper crafting, has so much to offer and can lift a mood, outlook and more! Fashion Do?? Heck Yeah!! What do you think? ?